NB. - Gloucester Veterans may have lived in any former Gloucester neighbourhood including New Edinburgh, Vanier, Rockcliffe, Overbrook, Alta Vista, Hunt Club, etc. Billings Bridge - The most important entry point from Gloucester into Ottawa since 1830. 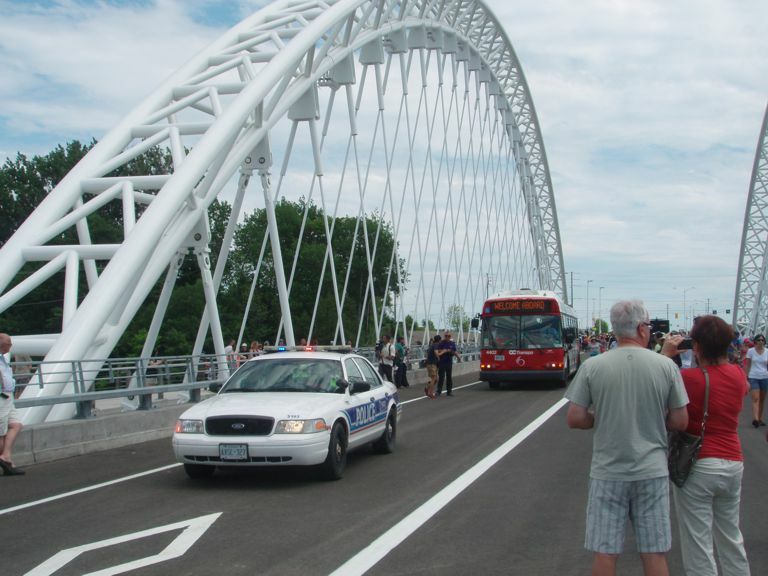 History in the Making - The official opening of the Strandherd-Armstrong Bridge - July 12, 2014. The new Rideau River link between Gloucester and Nepean. Next Board of Directors Meeting - Saturday May 11, 2019 at 9:30 a.m., 4550B Bank Street, Gloucester (lower level, parking accessible off of Leitrim Road next to the Fire Hall). The meeting is open to the public. . Originally, all the land bordering the Ottawa River east of the Rideau River to the Cumberland Boundary and south to Osgoode Township, belonged to what was then, the Township of Gloucester. Parts of the township were annexed by the City of Ottawa over the years, or were incorporated as separate municipalities. Eastview (now known as Vanier) was incorporated in 1908 and Rockcliffe Park in 1925. Annexations began with New Edinburgh in 1887 and followed by a much larger annexation in 1950. The remainder of the township was incorporated as a city in 1981. The city was then amalgamated as part of the city of Ottawa in 2001. The township is divided into four parts. First, the Junction Gore is bounded by the Ottawa River on the north, the Rideau River on the northwest, St. Laurent Blvd on the east and Walkley Road on the south. The Ottawa Front is bounded by the Ottawa River on the north, Osgoode Township on the south, Cumberland Township on the east and St. Laurent Blvd. and Ramsayville Road on the west. The Rideau Front is bounded by the Rideau River on the west, Walkley Road on the north, Ramsayville Road on the east and Osgoode Township (Mitch Owens Road) on the south. A small portion of the township along the Rideau River west of Spratt Road and covering from Honey Gables to Manotick is known as the Broken Front. Within these boundary, small villages and distinct communities were founded. A list of Gloucester Place Names can be found here. 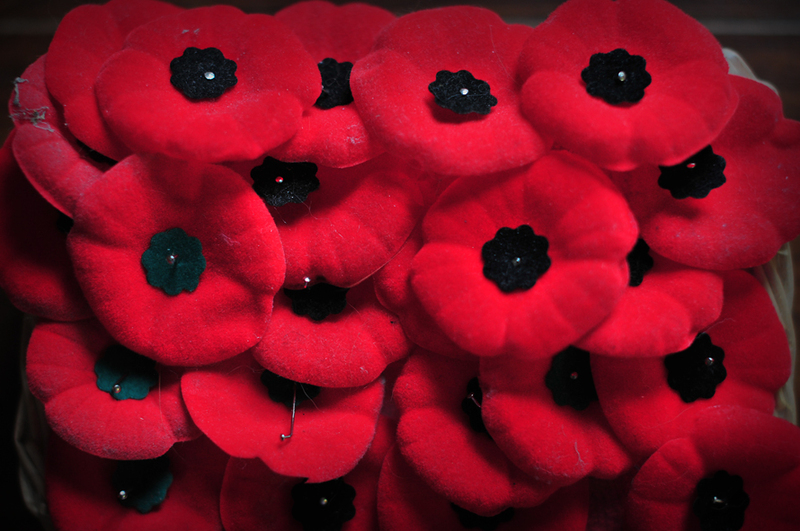 For the purpose of this list, the Ottawa Front was divided into two. The north portion is bounded by the Mer Bleue, a natural dividing point, and the Walkley Road baseline. A historic map of the township showing many old and modern place names can be found here . A map showing modern community names can be found here . Farms and market gardens flourished in the villages and communities in those early days. The township also originally included some of the Ottawa area's most expensive residential real estate in Rockcliffe Park. Many stories are written about these past times. The Gloucester Historical Society's publications, along with other interesting research material and books on local history may be viewed at the Society's research room at 4550 Bank Street (off of Leitrim Road). (January 20, 2019) Brief School and Church histories have been added to the website. Note: This is a work in progress and will be updated periodically. We welcome your contributions including additional information, donations of school and church histories and photographs. Click here for School Histories. Click here for Church Histories. Watch David Mowat's Presentation on the Woodburn and Ogilvie families involvement in the Klondike gold rush at the 2016 GHS Annual Meeting. Click here for the video. (June 18, 2016) The GHS wishes to thank Wasim Baobaid for filming, editing and posting this video on the Internet for public access. Gloucester History Page Improved - (February 13, 2011) A lot of information has been recorded in the Gloucester historic time-line over the last 5 years but as the time-line has grown more comprehensive, it has also become more difficult to find specific facts and stories. To make it easier, a comprehensive index has been added and navigation links will facilitate moving around the page. Click here to see the latest history page and index. Gloucester Place Names Project - Perhaps, one of the most important research projects in the Society's history. The Society is attempting to identify and assemble all place names, past or present, within the original territory of Gloucester Township and provide some information on each.. This will be an evolving project which will lead to the publication of a book. In the meantime, our research will be appearing on this website. You are welcome to review our Place Names page. Honey Gables - The Gloucester Historical Society is pleased to announce that we are collaborating with a community researcher with the end goal of producing a detailed written history of Honey Gables authored by the community researcher. Volunteers - If you are interested in history, there are opportunities to learn more about your community by helping out in the history room. Please contact us for details. Donations - The Gloucester Historical Society always welcomes donations that preserve Gloucester History. We will accept family histories, community histories, organization histories, church histories, school histories, photographs, historic documents and artifacts. Items of historic significance will be preserved in an appropriate local museum or local archives. If you would like to donate something, please contact us. GHS Newsletters Now On-Line - Click here to view almost every Newsletter published by the Gloucester Historical Society since 1993. New Publication (October 17, 2015) - Railways of Gloucester - and Beyond! is a 72 page book written by Leslie Goodwin and edited by Joan Scott. This is a follow-up of Leslie's excellent presentation at the 2015 Annual Meeting. The book covers all the railways that once crossed Gloucester Township and includes dozens of photos, many in colour and many that have never been published before. An excellent resource for those interested in local railway history. The price is just $20.00. New Publication (June 28, 2014) - 40 Years of Top Generation Club: 1974-2014 is an 80-page book produced for the June 2014 anniversary of the seniors’ club that was responsible for restoring the one-room Ramsayville School, built in 1894. The school, originally known as Gloucester School Section #13, was abandoned and left at the mercy of vandals in the early 1970s when a group of local seniors saw the potential for putting it to use as their clubhouse. Forty years later it is a designated heritage building in excellent condition that is used regularly by the Top Generation Club and other groups. The book, edited by Laurel Sherrer, features a history of the club and of the schoolhouse written by club member Belma (Alexander) Hull, as well as individual recollections of several long-time club members and others associated with the early days of the club. This 60 page book covers a wide range of topics in the history of Gloucester from Arenas to Women's Institutes. Click here for more details. The first of new series, this 24 page booklet explains the history of the post war Emergency Shelters at Uplands and Rockcliffe that helped address Ottawa's housing shortage at the time. The Rockcliffe Shelter was officially named Finter and was Gloucester's most short lived communities. At its peak, it had 1,700 residents. Its demise was highly controversial. Read why. Bytown was renamed Ottawa on January 1, 1855. This book provides 345 biographical profiles of well known residents up to our Centennial year. For further information, click here. 1. The Rideau River was originally the boundary between Gloucester and Nepean Townships as far north as Rideau Falls. 2. The north half of Long Island at Manotick was once part of Gloucester. 3. Hog's Back Falls bordered on Gloucester. 5. The Village of Rockcliffe Park was once part of Gloucester. 6. The City of Vanier was once part of Gloucester. 7. The jumble of roads, ramps and bridges next to RCMP Headquarters on the Vanier Parkway was once the thriving village of Hurdman's Bridge. 8. Greenboro Transitway station is adjacent to the former village of Ellwood. 9. Billings Bridge was once the centre of Gloucester Township including the first bridge to Bytown, a post office, 2 schools, 3 churches, the township hall, an Orange Hall, 3 ice houses, a brickyard, a toll gate and several other businesses. 10. The intersection of Russell and Walkley Roads was once the village of Hawthorne, traces of which have entirely disappeared. 11. Cummings Bridge once crossed via the island south of the current bridge. The island is named Cummings Island, named after the Cummings family who lived on the island for many years. 12. Ottawa's streetcars once travelled into Gloucester as far east as the north end of St. Laurent Boulvevard where the RCMP stables are now located. 13. The current Billings Bridge and Cummings Bridge were both originally designed for streetcars but neither would ever be used for that purpose. 14. Gloucester had two historic airports at Rockcliffe and Uplands, however, the first inter-city airmail flight into Ottawa used neither. That historic flight in 1913 made use of Slattery's Field, in Ottawa East. 15. Do you know which islands in the Rideau River originally belonged to Gloucester and Nepean? Porter's Island, Cummings Island and the north half of Long Island were part of Gloucester. Green Island and Nicholls Island (at Long Island Locks) were part of Nepean. The south half of Long Island was part of Osgoode Township. The Gloucester Chain of Office is about to be officially transferred to the City of Ottawa as part of a ceremony on Sunday, April 14, 2019 at 2:00 p.m. at the Gloucester South Senior's Centre, 4550 Bank Street. This was the former Gloucester Township Hall. The public is welcome to attend. The chain will be presented by the last Mayor of Gloucester, Claudette Coulas (formerly Cain) to Mayor Jim Watson. The Chain of Office will be on display prior to the presentation. 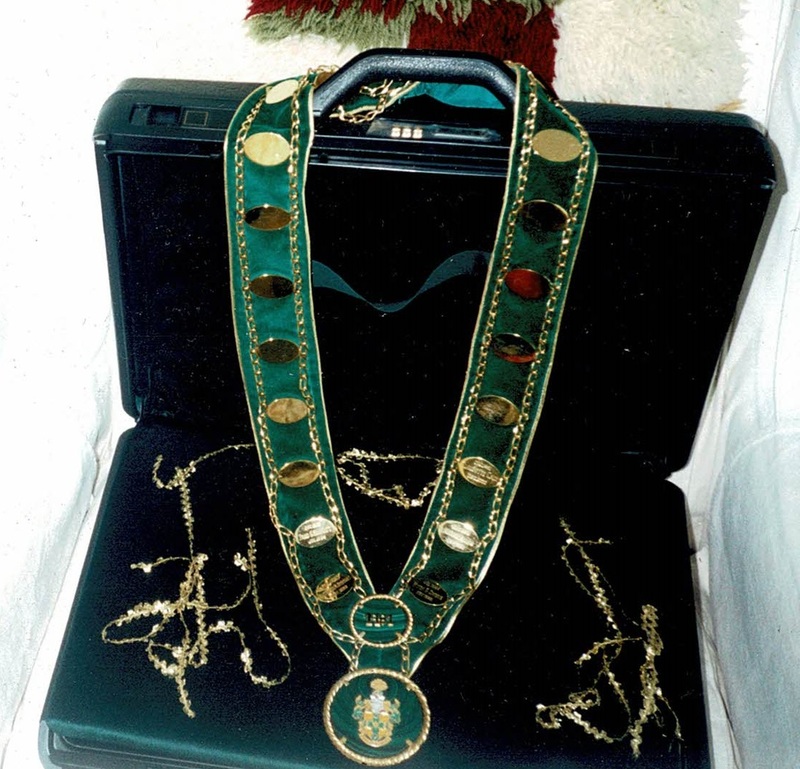 The chain was originally presented to former Gloucester Mayor Harry Allen on March 25, 1988 by page Erinn O’Brien, then age 8 at the Gloucester council chamber. It features 20 gold medals on a green velvet backing with the name of each mayor engraved on the medallions since the city was incorporated in 1981. The bottom of the chain features a 3-inch malachite medallion including a full colour version of the Gloucester Coat of Arms. The presentation featured a pronouncement by the official town crier and a message by Chamber president Regis Trudel. It was a symbol of the Chief Magistrate of the municipality and was to be worn by the mayor with dignity and respect and as a symbol of integrity, goodwill and fairness. The ceremony ended with a musical medley including a flute solo by Jacques Fontaine of Orléans. A reception of hors d’oeuvres and champagne followed. With city amalgamation impending, and as the very last motion, Gloucester City Council turned over the chain of office to then Gloucester Historical Society President Guy Legault for preservation. This took place at the last council meeting in December 2000. For many years the Gloucester Historical Society used the wooden bicycle which had been made by 17 year old James Blair in 1898. The official logo as shown above was designed by R.N. Strong, Graphic Designer, who was commissioned to come up with a meaningful design. The original bicycle is incorporated in the design and the colours of the Gloucester Historical Society, yellow and green are used. The green in the part below the word "Gloucester" represents a ploughed field, complete with furrows. Copyright © 2011-2019 Gloucester Historical Society. All Rights Reserved.